Scooper - Technology News: What can you do to close the gender gap in your workplace? What can you do to close the gender gap in your workplace? If you could make one change in your organization today, what would it be? What if I told you there was a step you could take to increase profit margins, raise your team’s collective intelligence and create a more innovative, fair and equal workplace? What’s the secret? Help more women get the experience and opportunities they need to reach leadership roles. In partnership with the Peterson Institute for International Economics, EY recently undertook a comprehensive study of gender inequality in corporate leadership. The sample size was both massive and global, surveying nearly 22,000 organizations across a wide variety of industries in 91 countries. Among all these different organizations, the results came through clearly and consistently: a firm with female leaders will outperform a firm with none. In fact, if 30% of a company’s leaders are women, its net margin will be six percentage points higher than a firm with no women in their executive ranks. The analysis finds a smaller effect when focusing on profitable firms, where the firm with greater gender balance has a profit margin that is one percentage point higher. But for most firms, even the smaller figure is substantial. To put that number in context, that kind of stark increase would increase profit by 15% for the typical profitable firm. And the benefits don’t stop there. An analysis of the S&P Composite 1500 , for instance, has shown that companies with women in top leadership positions have an “increase in innovation intensity”. Other research has shown that teams with more women are better at logical thinking, coordination, planning, problem solving – and have a higher collective intelligence overall . It should come as no surprise, then, that tech companies led by women tend to produce higher revenues and returns on investment than firms led solely by men. Given the myriad benefits for business, it’s almost economic malpractice not to create a culture and talent pipeline that can meaningfully increase executive gender parity. Indeed, it’s hard to think of any other initiative with so much potential that business leaders would not pursue. So in this case, have savvy business leaders capitalized on this opportunity? For the most part, they have not. Our research may have uncovered clear benefits that come from gender equity in business, but it also revealed a disappointing truth: women are still vastly underrepresented among top leadership in business. Globally, nearly one in three companies have absolutely no women in C-suite positions or on their board. 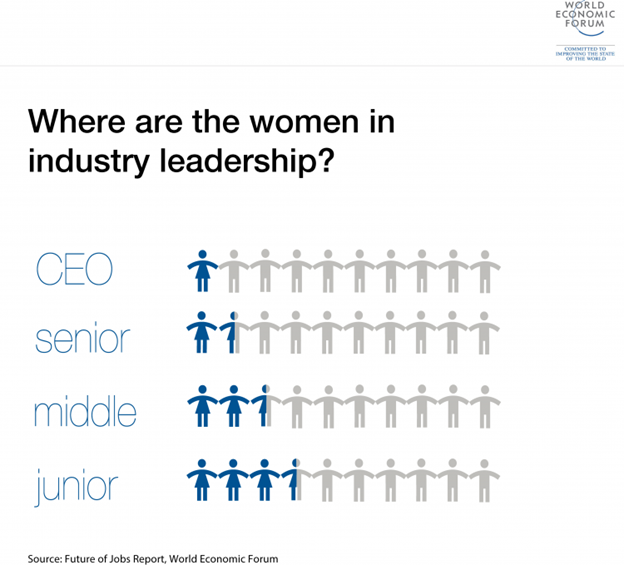 Half of all global companies don’t have a single female top executive. It’s long past time to change that trend – to empower women around the world to rise to the top, and to pull the world’s businesses up along with them. That’s why on International Women’s Day, I’m taking the Pledge for Parity: a promise to champion women in and outside of EY. Today, I encourage you to make a pledge as well. It may not look like mine. In fact, your pledge probably should look different, because you should look at your own position at your company, and in your community, and figure out how and where you can do the most good. Maybe you’re a manager, with the power to set a tone that creates a more inclusive workplace culture that values women’s and men’s contributions equally. Maybe you have a say in work leave policies, and can push for more flexibility, along with the generous maternity and paternity leave policies that help men and women advance equally in their careers. If you have more of a say in hiring and training, you might pledge to initiate programes that increase targeted recruitment, skills coaching and leadership education for women in the workplace. And whether you’re in your first job or nearing retirement, you can pledge to be a mentor who helps female recruits gain the skills and experiences they need to advance. It’s important for everyone in an organization to play a role here, because gender parity can’t be achieved overnight. It won’t work if you just focus on women at the top. We have to ensure that all women have access to the training, experiences and opportunities they need to advance at every stage of their careers. So make the Pledge for Parity. For business, workplace equity is an imperative that no company can afford to neglect. And for all of us, it’s the right thing to do. EY is sponsoring International Women’s Day in 2016 to help accelerate gender parity. Visit www.internationalwomensday.com/pledge and take a #PledgeforParity.